I can guarantee you we will get the horses to a good home in the end. We have been in touch with two estancias which do horse trekking in the more temperate areas of Bolivia around Santa Cruz. One of the horses is so popular out here in Ecuador that many people have asked us to bring him back if we stop in Peru! As for sores and feet - right now we have stopped for a couple of days not because of any serious problems but because the gaiters of our easyboots had been rubbing a little bit. Unfortunately while they were excellent in training, the last few days we have seen non stop rain (a tough first experience of long riding) which has resulted in a small rubs (no open sores) around the fetlock joints. Efforts without the gaiters weren't very successful as we lost one in mud fairly early on. Yesterday I vet-wrapped every fetlock and we have ridden to a town where we will see the farrier tomorrow. 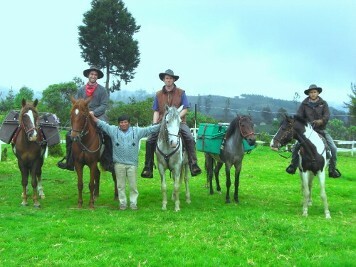 The photograph above shows (left to right) Ed, Phil, Nick and our horses Capriccio, Parajaito, Rocio, Gansa Salvaje and Noah, together with Palpollo, a friend here who helped us to find the horses. The packs are empty in this photo and we don't tie them so high in case you were concerned! These young men are trying to raise money for two charities; for more information, please visit their website.